We are excited to have you! Whether you are here for business or pleasure, choosing the most comfortable place to set down your bags and lay your head is important. Your cabin rental in Big Spring becomes your home away from home. It will never be exactly like home, but for a time, it will be the place where you seek time to relax, rest, and get ready for whatever has you in the great town of Big Spring, Texas. Take a look at our clubhouse and contact us with any of your questions. Ready to book? Visit our website! 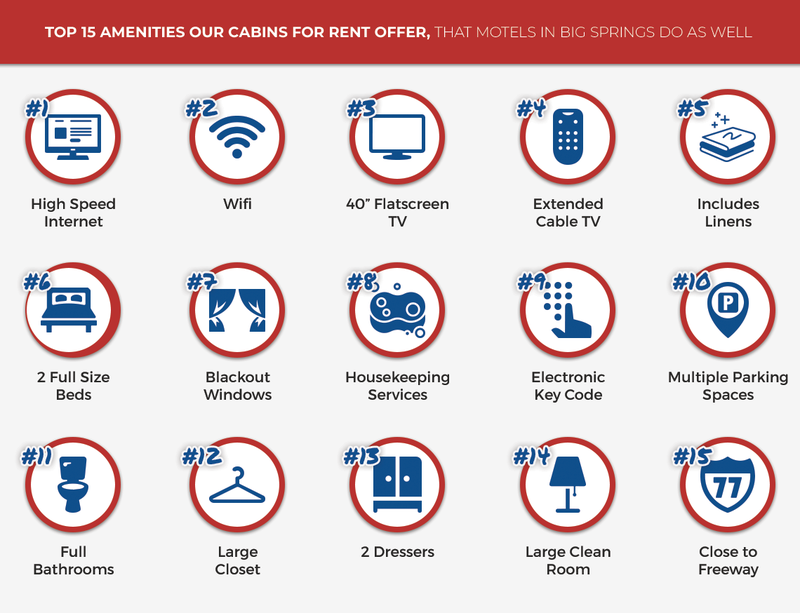 We are often asked, “why choose a cabin rental over a hotel or motel room?” Honestly, it comes down to your preferences and comfort needs. However, we would boldly say that if you plan an extended stay in Big Spring, Texas, our Top Rated Local® cabins provide the most benefits and comforts that you need during your stay. We offer an extensive list of free amenities, but that’s not the only reason to stay at Elite Cabins & RV Park. Keep reading to learn why our cabins might become your favorite place to stay in Big Spring. The saying goes, “you get what you pay for,” but is this really always true? 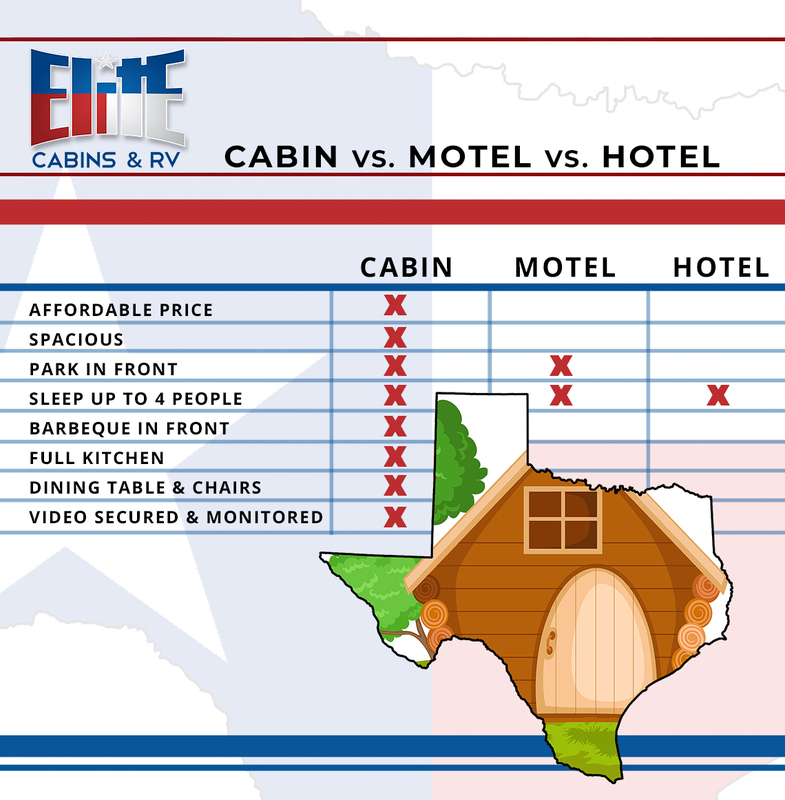 When comparing the rates for our cabins, they are substantially cheaper than those for a motel or hotel in Big Spring. In our case, the only thing “cheap” about our cabin rentals is the price. All of our cabins and our Elite Clubhouse are beautifully maintained and furnished with comfortable beds and furniture, immaculately cleaned after each guest, and offer plenty of room for you to spread out during your extended stay. When you are in town for a few short days, we understand the appeal of a small room with minimal comforts. However, if you are staying for an extended amount of time, you need space and amenities like a full kitchen, dining room, bathroom, and room to stretch your legs. Instead of a cramped room, a cabin rental offers you spacious living space like that which you enjoy in your own home. With a full size kitchen, bathroom, dining room, and ample living space, our Elite cabins can feel like home. We understand that nothing can compare to your own bed and chair, but when you have to be on the road and spend a prolonged amount of time in Big Spring, we do our very best to equip our rooms with those comforts that everyone needs to relax, rest, and recharge. Lugging your bags, gear, and anything else you brought with you for your extended stay through a parking lot in the hot Texas sun, does not sound appealing for anyone. That’s why we offer parking right in front of your cabin. Staying at our cabins offers ultimate convenience. Not only does our cabins offer full-size living space, they can sleep up to four people. This means that not only are you paying less than you would for a motel and getting more living space, but you are also paying less and are able to accommodate more guests. Being able to sleep more people, could also mean another reduction in cost. In Texas, we understand the value of a grill — barbeque is essentially a food group isn’t it? For this reason, we offer a barbeque right outside your cabin rental. Instead of having to carry all of your grilling utensils and spices across a courtyard, to the pool area, hoping there isn’t someone already using the grill, you have access to a grill next to your cabin. As we mentioned above, our cabins have a full kitchen complete with a stove, oven, microwave, refrigerator, and utensils. Eating out can be convenient and trying out new restaurants is fun, but there is nothing like a home cooked meal. Whether you are opting for healthy options, want to save some money, or just want to stay in, our full-sized kitchens give you the options you need when you here in Big Spring for an extended stay. Doing take-out when you stay at a hotel often means eating on a bed, in an armchair, or at the small desk. Eating in a hotel room is usually messy, uncomfortable, and doesn’t allow for accommodating guests. Even though these conditions are tolerable for a couple days, during an extended stay, balancing your plate of food while lounging on a bed will quickly become annoying. For these reasons, we offer a full dining room table and chairs. The Elite Clubhouse provides amenities such as full-size washers and dryers as well as a fitness center, pool table, a big screen TV and more. You get full-access to all of our clubhouse amenities free with your stay. Staying somewhere new will always take some time getting used to and to help with that each cabin is video monitored and secured so you never have to worry about your belongings while you are gone. When you stay with Elite Cabins & RV Park, you can trust that we will do our very best to accommodate your time with us. Whether you book your extended stay in our cabins or reserve one of our pull-through spots in our RV park, you can trust that you will have a comfortable home away from home. Not being in your own place with your family, friends, and your familiar surroundings can be difficult to deal with when you have to be away for an extended amount of time. However, even though there is nothing that can replace sleeping in your own bed and being in your hometown, there are ways to stay grounded while you’re away and enjoy your time here in Big Spring. When your not in your normal surroundings, it can be easy to get out of your normal routine. However, to stay grounded and connected to those things that are important to you, sticking to your routine as best as you can is a must. If you workout several times a week when you’re home, do your best to stick to your schedule. If you read every night, keep that up. Sticking to your routine can help you feel connected to the life you have at home. Especially if you have long days, it can be easy to forget to call your loved ones and if they have a busy schedule, it can be easy to lose touch. Before you leave, make a plan for how you will stay connected. Consider scheduling a weekly or nightly call, or emailing them. If you can, Skype or use FaceTime; seeing the faces of your loved ones can not only be comforting to you, but help young children feel connected to you. Maybe even consider sending a postcard or small souvenirs! There are certain things that make a house a home, and though you can’t always bring those invaluable things with you like your family, you can bring parts of home with you. Before you leave for your extended stay, choose a picture of your family that you love and favorite decorations that remind you love your life elsewhere. These small decorative items can help you personalize your home-away-from-home and battle homesickness. Even though we are long past those years of having a “blankie,” we all have pillows and blankets that make our bed our own. If you can bring those favorite items along with you on your extended stay. You might not be able to recreate your bed at home, but you can enjoy some of the same comforts that can not only help you get the rest you need, but remind you of home. It’s easy to think about where you would rather be when you’re away from home, but do your best to find the positive in your situation now. One way to do that is to try something new. Pick out an activity, local attraction, or restaurant and go try it! Just because you’re enjoying yourself doesn’t mean that you don’t miss your family and life back at home. You may find your next favorite food or hobby that will allow you to enjoy your time here — check out all there is to do in Big Spring! © 2016 Elite Cabins and RV® - All rights reserved.